All visitors to the Guild’s R&R room at the NEC show are invited to leave one of their business cards to be entered into a competition for a prize. This October the prize was a hamper, kindly donated by Whale. It was won by Guild member Stuart Bladon. 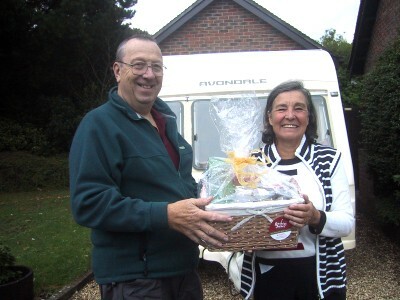 The photo below shows Stuart’s wife Jenetta receiving the hamper from Clive Mott, who offered to deliver it on his way home.